According to many mixologists these days, bitter cocktails are better cocktails. Amari, bittersweet herbal liqueurs from Italy like Campari and Fernet, are more popular than ever. But Italy's not the only place to turn for a bite in your drink. France has its own line of bitter booze, including an array of gentian liqueurs (gentian is a root used to bitter everything from Angostura to Moxie cola). And today we'll introduce you to Suze. 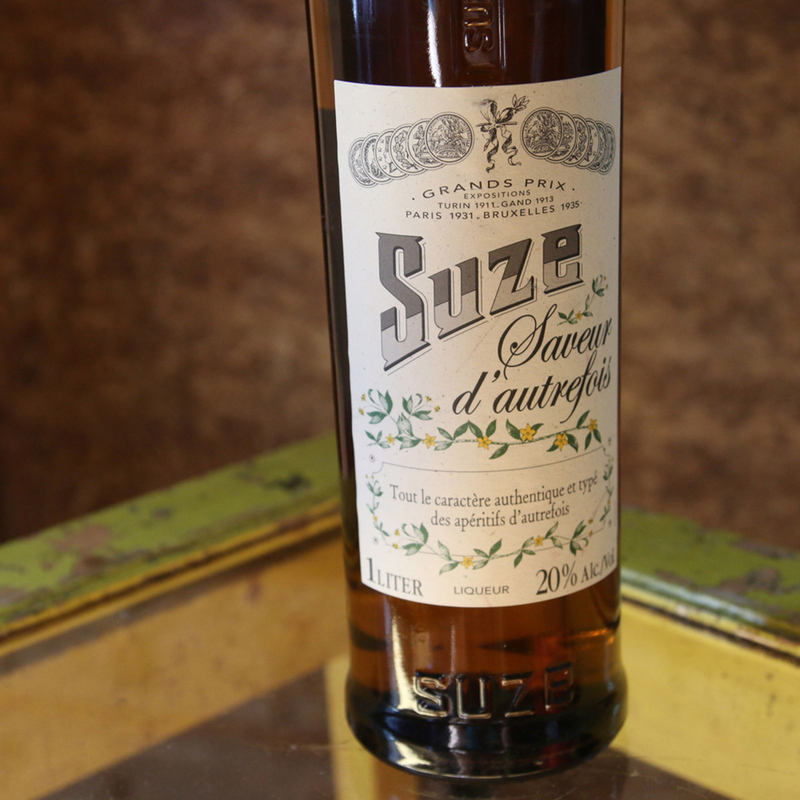 Suze, which has been in production since 1889, has other characteristics that go well beyond gentian’s bitterness. It's light in alcohol and light on the palate while still managing to be earthy and complex. While delicious on its own, really gets interesting in cocktails. Here are three of our favorites. Tonic is a perfect mixer for anything with an herbal or bitter element (see: gin), which is why it's an ideal pairing for Suze. Just as refreshing as a G&T but with its own quirks. Instructions: In a tall glass with ice, combine 1 1/2 ounces of Suze and 4 ounces of good tonic water (we're fans of Fever Tree). Squeeze in a lemon wedge and drop that in too. The spiciness of rye is a perfect match for the layered bitter-earthy flavors of Suze, which is why they work so well in this simple stirred cocktail, which tastes way more nuanced than its few ingredients might indicate. Instructions: In a mixing glass with ice, combine 2 ounces of rye, 3/4 ounce of Suze and 1/4 ounce of simple syrup (equal parts sugar and water). Stir until well chilled and strain into a rocks glass over ice. Garnish with a big twist of grapefruit—twisting over the surface of the drink to spray its citrus oils all over. We love to pair tequila with anything vegetal or herbal, which is why Suze and slightly aged reposado tequila come together so nicely in this lively, dynamic cocktail. Instructions: In a cocktail shaker with ice, combine 1 1/2 ounces reposado tequila, 3/4 ounce of freshly squeezed lemon juice, 3/4 ounce of Suze, and 1/4 ounce of agave syrup (equal part agave cut with hot water). Shake that all up and strain into a rocks glass with fresh ice. Garnish with a big twist of lime and a lime wheel.